In the past two years the Atari ST has been blessed with a wealth of graphics software, the most exciting of which are tools for creating animation. From the simple animated presentations of programs like Make It Move, to the powerful cartoon and object animation capabilities of such software as Animator ST, Art & Film Director and the Cyber Studio, there are almost endless possibilities available to the would-be animator. Just how to use your ST system to make your own animated presentations, commercials, cartoons, music videos, et al. is what this new series is all about. In a set of Step 1 articles printed at the end of last year, I discussed how I created a game demo and an animated sales video, but I only related the history of those projects, without delving into the specifics. Well, fear not, for if you are interested in this subject, it is here that we will explore the topic of ST animation on a close-in level. The trouble with trying to cover a machine with so many different animation systems available is that it becomes difficult to get specific without alienating all those other enthusiasts who do not have the same software. Therefore, wherever I can, I will keep the information as general as possible, and where specific examples are required, I'll try to give tips on how to do the same thing with other programs. To begin with, the topic will be what you might want and/or need as an ST animator. If you don't already have some animation software, you may wonder which programs you'll need. (You might want to note that all of the animation programs discussed here generate only low-resolution images—with one excetion—and therefore require a color monitor.) Furthermore, you might wonder what additional animation "paraphernalia" might be required. Let's talk about this, starting with. . . While Make It Move (MichTron) is a fairly decent program, it is really better for making animated presentations (sort of like cartoonized slide shows) rather than real animation. If you have it, you certainly can use it; but if you are serious about animation, you might be better off to buy one or more of the more powerful packages. Animator ST is a capable program, but not for animations, featuring detailed objects that have to move swiftly and precisely. Its handling of "cels" (detailed bitmapped artwork) is limited and a bit clumsy. But cel-type animation is not the reason to buy this program. Animator ST is a powerful and flexible "metamorphic" animation system that allows you to manipulate filled and unfilled polygons (closed geometric shapes), and make them change from one form into another as they move. 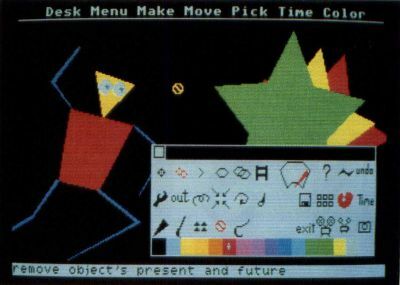 (The program keeps track of the points that define the objects and their relationship to each other, rather than an actual bit map of the screen.) In fact, the program even automatically accounts for perspective when rotating polygons around a point; so that they seem to get bigger as they come around the "near" side of the rotation, and smaller when on the "far" side. Aegis Development sells clip art that can be used as source material for cel animations with the Animator ST, but these should be considered only as a supplement to the metamorphic animation. If you really want an example of the power of the Animator, you should try to get a look at Steve Segal's "Dance of the Stumblers" (created with the Amiga version of Animator), which runs several minutes in length and matches the antics of a cast of polygonally constructed "people" to the music of Rimsky-Korsakov's The Snow Maiden. 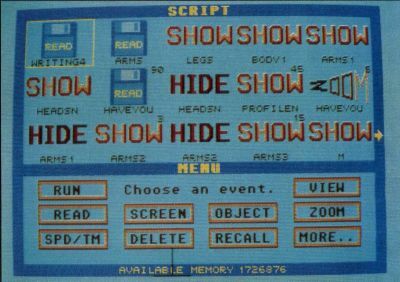 "Dance" was shown at the SI Graph computer graphics show in '87 and is part of "The Computer Animation Show." Jim Kent, the author of the program, tells me that there is some dispute over the publishing of this product, which has up to this point been marketed by Aegis Development. It is possible that a different company will be handling it in the future. I will attempt to keep you up to date on this. Art & Film Director (Epyx) is a two-in-one package, containing a full-featured, 16-color paint program (Art Director) and a flexible animation program (Film Director). Consider this package the flip side of Animator ST, for while Film Director does have some polygonal animation functions, they are limited (unfilled only and not anywhere near as flexible). Where it excels, however, is where Animator ST fails, in that Film Director is a powerful cel animation system. You can draw detailed objects in Art Director (or most any other low-resolution paint program) and import those screens as "pattern pages" that provide the source material for animating. Depending on memory, you can have either a maximum of two or 16 pattern pages available for any given animation. The animations can also be fairly long. (I created several animation files that each ran over a minute in length during playback.) Furthermore, they can also contain built-in sound effects, timed to the animation—something the other major systems lack. Film Director is best suited towards making computer-generated "cartoons" with flexible characters. Not to brag, but (currently) the best example of the capabilities of Art & Film is the promotional video I created for Epyx, which is ten minutes of nothing but art/film graphics and animation. The tape is available to dealers from Epyx, though at the time of this writing it was not generally available to the public. The last major package isn't a single program, but an entire family of products called the Cyber Studio (The Catalog). The two keystone products of this family are CAD-3D 2.0 and Cyber Paint. CAD-3D isn't really an animation program, but a tool for creating and modeling simulated three-dimensional objects. It generates views with lighting, perspective, etc., and can write a series of these out to an animation file (either low-resolution color or high-resolution monochrome). Cyber Paint is really a complex paint-box utility that stores a series of "frames" by comparing each to the one preceding it and storing only the differences. It can import animations created with CAD-3D (low-resolution files only; no monochrome), in addition to creating its own from scratch. Its tools include special effects used for, among other things, moving, sizing and rotating images or parts of images. Cyber Paint's real advantage is that its "changes only" method of storage makes it one of the fastest playback systems available. In fact, it has some limited capabilities to import/export data from/to Animator ST. Film Director animations can also be imported through a very laborious process of saving out frames of an animation as pictures, converting them to either NEO or DEGAS format and reconstructing them in Cyber Paint. In addition to CAD-3D and Cyber Paint there are other related tools: Cyber Control is a programming language that allows you to automate CAD-3D (particularly useful for creating animations); Cyber Texture lets you "wrap" pictures around 3-D objects for use in CAD-3D; and Cyber Sculpt is an advanced tool for creating and editing complex 3-D objects. Furthermore, there are also a series of "design disks" providing preconstructed 3-D objects and tools for use in the creation of animations. A demo videotape called CyberMation is available from The Catalog (for a steep $19.95), which gives many good examples of the kinds of things this family of software can do. This entire system is very powerful, allowing you to do such things as have 3-D cars driving around street corners with perspective, shadows, etc. But to really get the most out of the system, you have to have at least CAD-3D, Cyber Control and Cyber Paint, and they'll cost you around $200. Add nice tools like Cyber Sculpt and a design disk or two, and you could be laying $250 to $300 for software alone. And, while Cyber Paint can be used alone (and I recommend buying it even if you have no interest in the other Cyber products), CAD-3D isn't that useful to an animator without Cyber Control, which is not for the nonprogrammer because it is a programming language similar to BASIC. So, if you want flashy, colorful animation, and don't need much in the way of small details, you might want Animator ST. If you want to make 2-D cartoontype animation with built-in sound effects and nice articulation, Art & Film Director is probably for you. But, if you want to recreate the titles of Star Trek—The Next Generation, and have a 3-D starship zing by (or have 3-D characters, etc. ), you'll need several of the Cyber Studio products. Personally, as a serious animator, I have all of these products, but you may not need or want (or be able to afford) so many; so you should choose carefully. Get a look at each of them so you'll have a better idea of what they are, what they can do and if they're what you think you'll need. Okay, since you're reading ST-Log, we'll assume that you already have an ST. But is the model you have suitable for your plans? Let's see. A 512K ST can run Make It Move, Animator ST and Art & Film Director, though the latter two can't really flex their muscles in such limitations. 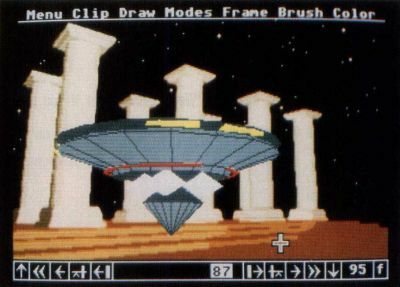 To run CAD-3D 2.0 requires a minimum of one megabyte of RAM, and the more memory, the better, particularly in the case of memory-hungry Cyber Paint. A one-megabyte machine will do just fine for most things, but if you intend to create complex Cyber animations, I do not hesitate to recommend a four-megabyte ST! I kid you not! I have some Cyber animations that run about two megabytes, and have occasionally topped three megabytes! Furthermore, if you plan to create a lot of animations, or just plain big ones, you'll probably find floppy disks either too slow or too little. What you really need is a hard drive (if you don't already have one). A 20- to 30-megabyte drive is okay; but if you plan to do a lot of animating, again, bigger is better. Now, if you plan to do anything other than show your animations on your ST screen, you'll need something to transfer them to. The most likely medium is videotape, of course. You can either tape directly to a VCR by getting a composite video line out of your ST or by videotaping the screen (not an easy task, and the subject of a future article). I recommend the direct composite video methods for most purposes. Just about any VCR will do for recording, although it's best to have one that has a pause that won't show a "jump" when you stop and resume recording. It's not necessary to have one that can record frame-by-frame, as all the animation programs have real-time playback. An effects head, and perhaps sound-on-sound dubbing, is worth having, if you can get it. The Cyber family supports certain types of computer-interfaceable videotape decks, like the Sony 8mm decks, using a package called Cyber Video. This is only useful if you have the right kind of deck and create Cyber playable animations. Even if you plan to have all of your animation taped on large professional systems (such as on ¾-inch or one-inch formats), it's a good idea to have your own VCR for creating "director's rough cut" tapes and tests. Of course, getting the animation on tape in the first place can be a challenge. Except for a handful of 1040STfm machines, only the 520ST models have an RF modulator, and, thus, provide their own composite video output. On such a RF-equipped machine you can either take the antenna-out to the video deck, or "tap" the composite-video line on the monitor port. One of the easiest ways to do this is to use a Monitor Master switch box (Practical Solutions), which automatically offers the composite signal if your ST has an RF modulator. (We'll talk about making a custom cable at a later date.) The best solution for just about all STs, RF-equipped or not, is the VideoKey (also by Practical Solutions), a device which converts the ST's RGB output to a quality composite-video signal (often better than the composite output provided by RF-equipped STs). It stands to reason that if you use RF or composite output, you should have something to view it on. A good color TV or composite color monitor will do nicely. You might even leave it connected while creating/testing your animations, so that you can see if everything is clear. What appears on the RGB monitor is often shockingly different on a TV or composite display. Details get lost, colors bleed and hues sometimes look totally different, requiring adjustment before going to tape. One really fun hardware goody is a Genlock device that allows you to overlay your ST's low-resolution graphics on regular video. Currently, JRI is awaiting FCC certification on a Genlock device, which should (I hope) be available by the time this article sees print. The major limitation of this first model is that it works only on Mega STs (a 520/1040-compatible model is planned). Furthermore, it does not allow "overscanning" like the Amiga Genlocks do (overscan means that the computer image is adjusted so the edges of the logical screen do not appear). Look at your ST monitor (make sure it's on!) for a moment and notice the blank "border" around the screen picture. With overscan, that border would not appear. Overscan or not, the Genlock is worth having because it allows for interesting effects. Also, JRI's is so simple to operate that it requires no software. You could even use a program like Easel ST to replace the GEM desktop background with a blank black backdrop and Genlock MTV under it! So you could watch videos while working with your files. The Genlock works by making all black pixels transparent to the video image. By black I mean color 000 on your palette. JRI's mega-compatible Genlock plugs into the internal DMA port and expansion bus in a Mega ST. It provides RGB output for ST graphics only, composite-video out with or without the video mix, and a remote control for special effects (fades and dissolves, etc.). It is planned to retail for about $500. For the curious: My system is a Mega ST4 with a 65-megabyte hard drive, external floppy drive, monochrome, RGB and composite monitors—Monitor Master and VideoKey—plus a Supra 2400 modem soon, a Genlock! I also have a four-head, digital freeze-frame VHS VCR with slow-motion playback and video-in-video capability. In addition, I have a one-megabyte 520ST with double-sided drive, a 20-megabyte hard disk and an RGB monitor as a backup system. If you are serious about doing good work, you might also consider obtaining one or more of the following items. If you plan to make traditional sorts of cartoons, then one of the best things you can do is to purchase (yes, buy, don't copy!) videotapes of old theatrical cartoons (not anything made-for-TV, as they tend to be poorly animated). My recommendations are good, high-quality tapes of old Warner Bros. cartoons—just about any of the 24-Karat Collection, and specifically tapes like A Tribute to Chuck Jones. Also those Warner cartoons sold by MGM/UA are a good choice (you can safely avoid any tape listing Speedy Gonzales as the star), especially the MGM/UA release of Tex Avery's Screwball Classics (study very carefully the dust left behind the detective in "Who Killed Who?" when he zips away from a bunch of falling bodies). If you have a VCR with a good freeze-frame you can learn a lot by studying how various effects (motion blur, etc.) were achieved in these cartoons. I don't recommend too much of the Disney stuff, because they're generally over-priced (three cartoons for the same price that will get you six to eight Warner cartoons), and aren't as funny or innovative. If you plan to echo a specific style or type of animation, try to purchase videotapes of that type of thing, so that you might study it and learn from the successes and failures of others. If you want to emulate a Japanese cartoon (just please animate it better than they do! ), study some Japanese cartoons Also, even if you do plan to work within a certain framework, don't deny yourself the opportunity to broaden your background. Study all kinds of animation, regardless of whether they're what you like or not. You might learn something that you can apply in your own work. In the book department, almost nothing beats Frank Thomas and Ollie Johnson's exhaustive Disney Animation: The Illusion of Life (Abbeville). Try to get the hardcover edition, because the paperback version is edited and missing some interesting chapters and illustrations. No matter what program you're using, many of the observations and lessons discussed in this book can be useful to you. Finally, if there's an animated film (and I don't mean those commercial cartoons like the Care Bears or other such pabulum!) or animation festival playing at a local theater, go to it. Don't wait for it to come out on video. Study the animation and pay attention to the parts that people respond to (and in which manner). In doing so you can learn more about what people like and dislike than just about any other way. I'm trying to anticipate what the aspiring ST animator might need to know, but it's possible I might miss some topic or details that you might like/need to know about. Thus if you have any questions, comments or suggestions regarding this feature, please write to me in care of ST-Log, P.O. Box 1413-M.O., Manchester, CT 06040-1413—or send E-mail to me on DELPHI (my username is MAURICEM). Next issue, it's to work, as the topic will be the act of conceiving an animation project and bringing it to its first great milestone: the storyboard. 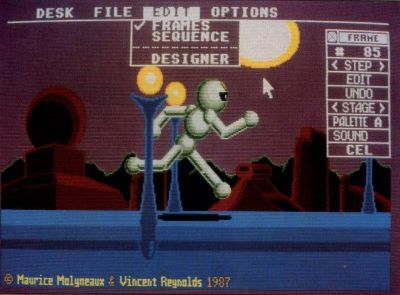 Maurice Molyneaux began playing with stop-motion model animation in high school and started working with computer animation on his 800XL using MovieMaker. Using his STs, he has created animated presentation and sales videos for software publishers, and co-authored two Cyber Studio design disks. He continues to produce aftermarket products for ST animation packages and consults on animation systems, as well as continues work on various video-related projects.